At first dyeing is performed in dyeing lab and then starting for bulk production. Dyeing lab work is called lab dip development. A lab dip is a swatch of fabric test dyed to hit a color standard. Lab dip plays an important role in dyeing process. Bulk dyeing process completely depends on the lab dip. 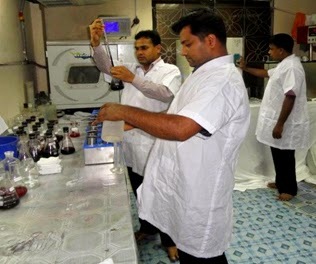 In the lab, lab dip or sample is developed by the textile engineer or technician. Flowchart of lab dip is given below.